Ski runs were fantastic, but afterwards ski's ly scattered all over the place. The patented design is constructed from durable and completely maintenance free stainless steel, with a soft coating of the hooks holding the skies. 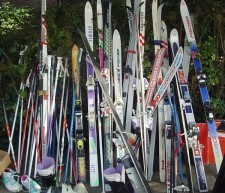 To accomodate larger numbers of ski's and snowboards, several racks can be mounted side-by-side. With an accessory locking plate you can secure your ski's against theft. Using a standard padlock (not delivered by us), you can lock the locking plate. Send us an e-Mail if you have further questions! Use the ORDER FORM to place your order or send us an e-Mail if you have any question! This picture shows the red ski's being securely locked in place. The Leumark site has the Dutch quality mark mkbOK. We are searching for Dealers in several countries. Interested? Give us a call or e-Mail us. You could read the terms of delivery.